Story Coffee on St John’s Hill in South West London is one of the capital’s speciality coffee stalwarts, having first opened in 2014. I took my time in visiting, only calling in for the first time towards the end of the September last year, when I found, to my surprise, that Story Coffee had a second branch, a little sibling if you like, called Story Works, just down the hill at the back of Clapham Junction. Much smaller than the original, Story Works has a cut-down offering while retaining many similarities with Story Coffee, including a gorgeous two-group Kees van der Westen Spirit espresso machine. Like Story Coffee, there’s a single option on espresso, but pour-over has given way to batch-brew. Similarly, while there is food, Story Coffee’s brunch menu has been replaced by avocado on toast, grab-and-go salads and superfood smoothies, although there’s still a good selection of cake. 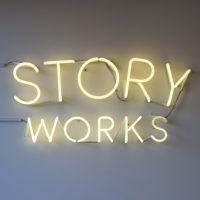 Story Works opened in the first half of 2018, located directly opposite Clapham Junction, between the ramp leading up to the rear entrance and the main entrance on St John’s Hill. It’s a different concept to Story Coffee, where the focus is on sitting-in and the excellent brunches. In contrast, Story Works is all about grab-and-go and quick service, with a focus on superfoods. In support of this, it’s cashless, only accepting credit or debit cards, and only has takeaway cups, so don’t forget to bring your own. Story Works is much smaller than Story Coffee, which wasn’t that big to begin with! A single, glass door, slightly offset to the right, is flanked by a floor-to-ceiling window on either side. If you want to sit outside, there’s a solitary bench in front of the left-hand window. Inside, Story Works is long and thin, with high ceilings and a plain, white and dark wood décor. There’s a grab-and-go chiller cabinet on the right, beyond which is the counter, till facing the door on a sloping section that is about 45° to the wall. There’s a Mythos One grinder on the corner, followed by the gorgeous Kees van der Westen Spirit along the left-hand side of the counter. The seating is on the opposite side, starting with a two-person window-bar to the left of the door. This is followed by two long, padded benches with narrow, projecting tables along the left-hand wall, separated by the retail shelves. The first bench, which only has one table, is opposite the chiller cabinet, while the second bench, with two tables, runs opposite the counter all the way to the back wall. While I was there, Story Works switched between the Momentum blend from Modern Standard or Square Mile’s Red Brick on espresso, with a single-origin on batch-brew. However, at the end of last year, Story Coffee started roasting itself own espresso blend, which, as far as I know, Story Works is now using. My flat white, meanwhile, which was expertly made by my barista, Vaggelis (who served me on my visit to Story Coffee the day before), used Modern Standard’s Momentum blend. This went really well with the milk to create a lovely, smooth drink in my Therma Cup. This entry was posted in Cafe/Roaster, Cake, Coffee Shops, Lunch, Saturday Short, South West London, Stations Nearby, Takeaway and tagged include, Modern Standard, Story by Brian Williams. Bookmark the permalink.